She Put Colored Eggs In A Muffin Tin. I’m Never Using My Kitchen The Same Way! Like mother, like son, I guess — because I’m fairly lazy when it comes to cooking. I like anything that’s easy,which is why I can appreciate kitchen-friendly life hacks. You especially don’t want me baking for you. Apparently, there’s a difference between baking powder and baking soda… I just couldn’t tell you what it is. Yet I still have an entire cupboard of baking supplies, including a muffin tin (or cupcake tin, or muffin pan, or cupcake pan…whatever you want to call it!). My muffin tin sits there day after day going unused because I’m just not the type who bakes, but I recently found some ingenious and creative ways to use muffin tins for purposes beyond just making delicious baked goods. The following “hacks” for using your muffin tin are easy, fun, and definitely creative. Some of them still require cooking, but they’re definitely nothing I ever expected. Now that I know I can make hard-boiled eggs with my muffin tin, that’s going to save me so much time in the morning! Check out these creative muffin tin hacks and SHARE them with friends! 1. Vary the colors of your Easter eggs and avoid messes by using muffin trays! Rather than using just a few cups, you can create a variety of colors, and each egg can sit in the dye for a little longer. This also cuts down on cleaning. 2. Speaking of eggs, you can even make hard-boiled eggs in the oven. Just bake for 30 minutes at 325 degrees. Once they’re done, let them sit in ice water for 10 minutes, and you’ll have a perfect hard-boiled egg. 3. Bake cupcakes right into ice cream cones. Delicious and cute. 4. Make savory and scrumptious bacon cups using some aluminum foil and your muffin tin. 5. 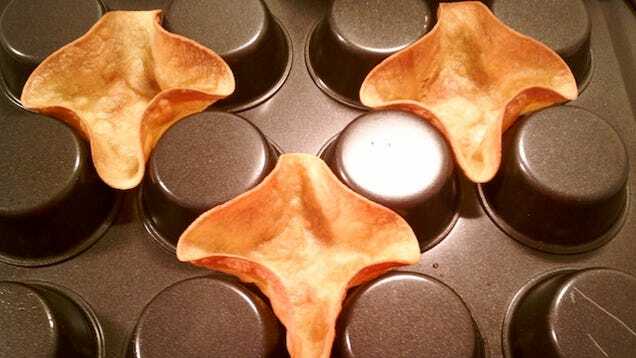 You can even make homemade tortilla bowls! This is my favorite recipe. I made miniature taco bowls the other night for dinner and they were a huge hit, and I’m not even that great of a cook! 6. If you’re feeling crafty, use the muffin tin to create a homemade advent calendar. 7. You can even make adorable soaps for kids (or adults!). Bath time never seemed so fun. You can learn how to make thesehere. 8. These are also great trays for storing toppings and condiments. I think this is especially great for picnics, taco nights, and anytime the grill is being put to use. 9. Freeze slices of lemon with some water to get awesome flavored ice cubes that are perfect for summer. 10. if you’re a party person, consider serving your next cheese plate or charcuterie platter in a muffin tin. 11. You can use old, broken crayons melted in a cupcake tin to create new, beautiful crayons. 12. Use your old cupcake or muffin tins to store nails, screws, washers, and other small tool bits. 13. Or get back into the kitchen to make some delicious deep-pan pizzas. These are perfect for passing out at parties. Complete recipe at Package Your Life. 14. De-clutter your desk by using a muffin tin to help get organized. 15. Cut photos into circles measuring the same diameter and area as the bottom of the muffin tin holes to create an adorable picture frame. Please SHARE these awesome tips with friends. She Dropped A Bottle Into The Recycling Bin. NOTHING Prepared Her For What Happened Next! This Is AMAZING! Apparently, This Funny Dog Thinks He’s Donald Duck–LOL!